This entry was posted in Late Discovery Adoptee Research, Late Discovery Adoptees on August 17, 2013. While the write-up I’ve c’n’p’ed suggests this is only for LDAs, it has been clarified elsewhere that ALL adoptees can go and answer, but may not find so many of the questions relevant. A useful, easy to understand guide to publishing a blog on Kindle. This document contains the National Minimum Standards (NMS) applicable to the provision of adoption services. The NMS together with the adoption regulations form the basis of the regulatory framework under the Care Standards Act 2000 for the conduct of adoption agencies and adoption support agencies. The NMS for adoption are issued by the Secretary of State under sections 23 and 49 of the Care Standards Act 2000. The Secretary of State will keep the standards under review and may publish amended standards as appropriate. Minimum standards do not mean standardisation of provision. The standards are designed to be applicable to the variety of different types of adoption agencies and adoption support agencies. They aim to enable, rather than prevent, individual agencies to develop their own particular ethos and approach based on evidence that this is the most appropriate way to meet the child’s needs. • Children and adults affected by adoption receive an assessment of their adoption support needs. • Service users confirm that the adoption support service provided met or are meeting their assessed needs. 15.1 Where services are commissioned by an adoption agency, a three-way working relationship is developed with the adoption agency and the Adoption support agency working in partnership to most effectively meet the needs of the service user. Commissioning arrangements are underpinned by a written agreement and are reviewed at regular intervals. 15.2 When deciding whether to provide a service, or which service to provide, the agency has regard to the assessed needs for adoption support services, listens to the service user’s wishes and feelings, and considers their welfare and safety. 15.3 The service user knows, and receives written information about, the service they are to receive; what the service is designed to achieve; what is involved in the particular service provision and how the service will be monitored to ensure that it is delivering the intended outcome. 15.4 Prospective adopters and adopters are made aware of, and encouraged by, the Adoption Support Services Adviser to access support services, and apply for tax credits and welfare benefits which are available to them and advise them of their employment rights to leave and pay. 15.5 The Adoption Support Services Adviser assists prospective adopters and adopters through liaison with education and health services; across local authority boundaries and between departments within the local authority. 15.6 Adoption agencies seek feedback from service users on the success of the service provision. This feedback is recorded centrally and on the case record of the service user. • Adopted adults and birth relatives are assisted to obtain information in relation to the adoption, where appropriate, and contact is facilitated between an adopted adult and their birth relative if that is what both parties want. 16.1 Information is provided about the Adoption Contact Register and how to register a wish for contact or no contact; and about absolute and qualified vetoes and the potential benefits and disadvantages of registering a veto. 16.2 The applicant is met and their identity verified before any information is disclosed to them, contact facilitated; or a veto is registered. 16.3 The Appropriate Adoption Agency and the Intermediary Agency agree a timescale for responding to an enquiry and keeps the Intermediary Agency informed of the progress (or lack of progress) of their enquiry. 16.4 Service users are helped to understand the possible effects on them and their family of the outcome of their search. 16.5 Service users are consulted on decisions made in relation to their service provision. Consultation with service users is recorded on their individual records. 16.6 Agencies seek feedback from service users on the success of the service provision. This feedback is recorded centrally and on the case record of the service user. The trenches have been dug, and now the foundations can start being poured. I have an appointment on Wednesday at the bank with the business advisor so that I can open an account for PostAdoption Charity. I have a Trustee, and I have someone willing to be Patron. I have a CafePress store with at least two designs stocked. I hold both http://postadoptioncharity.org.uk/ and http://postadoptioncharity.co.uk/ domains (both of which need re-directing to here). 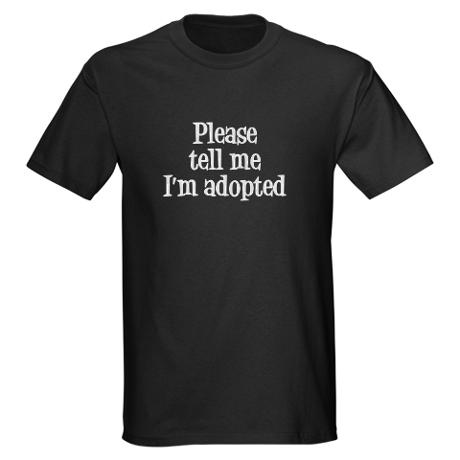 I have the @PostAdoption Twitter account. I need to work out a business plan, I think. I also need to work out what criteria people are going to have to fit into in order to be able to obtain the funding that I’m hoping to raise so that people can get the help I’m hoping to be able to give. Being entirely new at this, I’m not really sure what else I need to get going effectively, so all pointers appreciated. Until then, I’ll be found browsing through pages like How to write a business plan and Recipe for success: Business plans while trying to work out how to build this into viable concern. *nodding* all the way through. Not very quickly, I admit. Much of that has been to do with the hassles I’ve been having in dealing with the whole being adopted part, still. Last night, Bestest-Wifey asked me how far PAC had come on since its inception, and I had to own up to having let things slide whilst trying to fight my own battles as well as the battle to get the adoptee voice heard. Having suddenly discovered Twitter – correction, not discovered ’cause I’ve had an account for ages, but suddenly started using Twitter last week (after discovering it gave me pretty much direct access to the UK’s “Adoption Czar” <vom> @martinnarey), I did my usual going through and nabbing my usual blog/page names, and since Bestest-Wifey reminded me of this charity (not that I’d really forgotten it, just haven’t really had time/energy to deal with it), I got to work on creating the PAC Twitter account. In order not to annoy too many people by random spammings with this new account, instead of pimping PAC outwardly, I instead decided to kinda reverse-engineer my spamming, and so went through and added ten ton of accounts that used or posted with the words #adoption, #adoptee, or #adopted in their whatever-it-is-Twit-searches. Hence currently, PAC Twit is now following almost 1000 accounts. In one of the accounts, my eye caught a link that I decided to follow, which led me to the APRC (Adoption Policy And Reform Collaborative) site (that I’m guessing is also pretty much in its infancy, although far surpassing this (currently) miserly effort of a site) via Adoption Echoes A Perfect Storm post. It was at this point that I gave up waiting to make a stand-alone web-site for PAC, and instead decided to migrate this-a-way over to WordPress. Opened up, logged in, clicked “Create a New Blog”, typed in postadoptioncharity for the new name, and was subtly reminded by WP that a blog of that name already existed. Yup, it’s been that long since I started trying to throw this charity together that I actually forgot that I’d already created a WP blog for it. Thus, today is HOPEFULLY heralding in a new era in which PAC actually begins to move forward as a serious concern, and can hopefully start making some money to help fund me and all the other adoptees who need the psychological help that’s (at least currently) unavailable on the NHS, despite it being the Government, the Law Makers, and their Social Services that did this to us in the first place. Even if PAC doesn’t make a single penny though, it’s less important than fighting to get adoptees’ voices heard, and to get funding somehow so that adoptees can actually get in to see specialist adoption therapists who actually understand all the inverse realities that being adopted can convey upon a life.